The author of this book confessed, and wrote I am at a loss to understand as to why people describe love as a personal story. Love is not the story of one or a few individuals, it is a universal story because, there is hardly anyone in the world who has not passed through this experience. The only difference lies in the truth of acceptance and hypocrisy of denial. 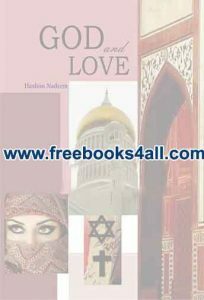 Through the words scattered in the pages of this book, I have endeavored to interpret the way in which love and religion influenced me. The battle of love and religion was fought by my heart and bitterly experienced by my soul but I leave it to you to decide whether it was won by love or religion.